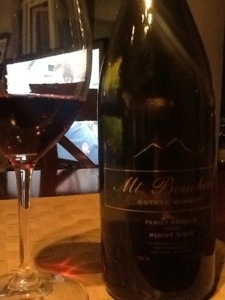 Friday night and the time is right for….Pinot! We visited the Mt. Boucherie winery near Kelowna in BC’s Okanagan Valley and enjoyed the tasting room and knowledgeable family members talking about their extensive range of wines. Mt. Boucherie produces three levels – the entry level Estate, the mid-priced Summit Reserve and the pricier Family Reserve wines. This Family Reserve is clear with a medium minus ruby core moving to a wide pink rim The legs are noticeable and even legs. The nose has better than average intensity and youthful aromas of cherry, cedar, spice and classic Pinot mushroom. Dry with medium plus acidity and silky and medium tannins, there is medium plus alcohol and average body. The flavours show red cherry, rich truffle, earth and cedar with a spicy kick. A high priced wine at C$30, this has an average finish and is WSET Good. Drink now; may be kept 1-2 years for additional aging. This entry was posted in BC, Pinot Noir, RED and tagged BC wines, Kelowna, Mt Boucherie, okanagan, pinot noir, red wine. Bookmark the permalink.